The U.S. Army Space and Missile Defense Command/Army Forces Strategic Command's two Army astronauts received their new rank in a unique way Sept. 27. 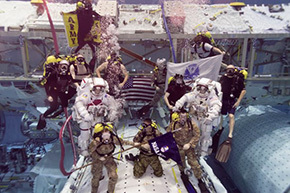 Army astronauts Col. Andrew "Drew" Morgan and Lt. Col. Anne McClain, both from the astronaut class of 2013, were promoted while underwater following required training in the Neutral Buoyancy Laboratory at the Sonny Carter Training Facility. The NBL is an astronaut training facility featuring a large indoor pool of water in which astronauts may perform simulated EVA tasks in preparation for upcoming missions. Trainees wear suits designed to provide neutral buoyancy to simulate the microgravity they would experience during spaceflight. McClain, who was promoted first, said, "It truly is an honor to be in this suit in this pool working with this team, and it's an honor to be a lieutenant colonel in the Army. Thank you for celebrating this major milestone with me." A 2002 Marshall Scholar also, a senior Army aviator, she has more than 2,000 flight hours in 20 different aircraft. She is a rated pilot for the C-12 Huron (King Air), UH-60 Black Hawk and UH-72 Lakota, and instructor pilot for the OH-58D Kiowa Warrior. She is currently assigned to launch Dec. 20 to serve aboard the International Space Station as a flight engineer for Expedition 58 and 59.